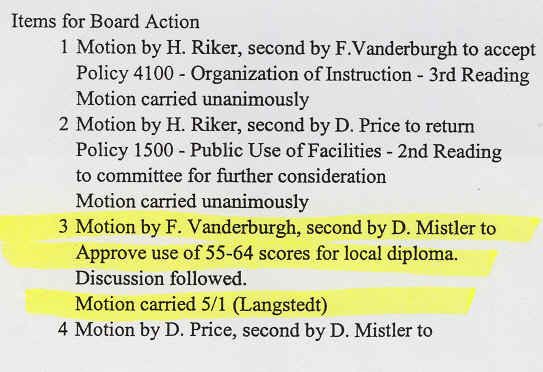 Former superintendent Tom Bailey now denies that he pushed for lowering the graduation standards below the state standard of 65. In the six years that I was on the S-VE board, our district was twice on the New York states worst of the worst schools list. The state notifications of the need for improvement were hid from the public. Little was done to improve the education, but an enormous effort was made to fool the people in believing that we were doing fine. My efforts to improve education in our district were opposed by the school bureaucracy and many members of the Board of Education because the teachers union had spent money and time in getting then elected. Improving education would be so inconvenient to them. I took up the need etter education in the contract negotiations with the teachers union. Jim Loomis and Denise Price were my fellow negotiators. My fellow board members opposed my demands for better education so much that they demanded that I would be fired from the negotiating team. After few years of state mandated tests it became possible to pinpoint which teachers were not doing a good job. I therefore suggested that the district would improve the teacher pool. Jim Loomis declared that he did not want incompetent teachers replaced. People, who pushed for and voted to drop our graduation standards are now denying it or passing the buck. They have good reason to be ashamed, but look below at the agenda and the minutes of the meeting and decide for yourself who is lying. 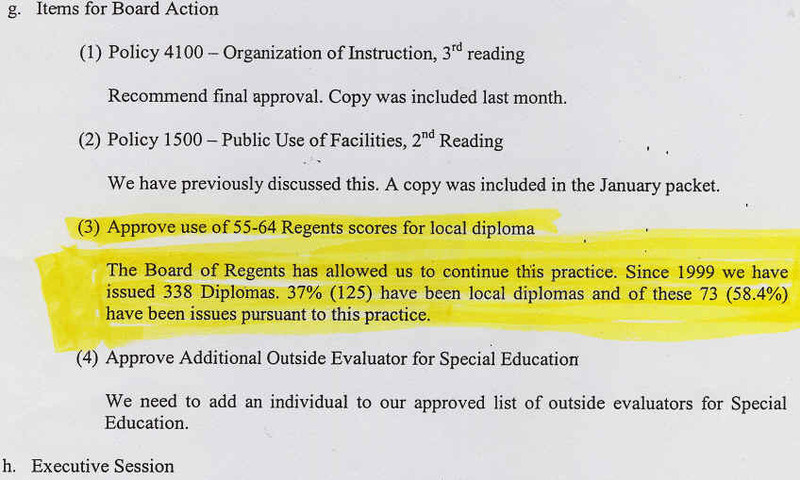 When the instruction he supervised, failed to meet the state minimum of 65 for a Regents diploma, S-VE superintendent did not push to improve the education to meet the state standard. His move was to cover up the failures by lowering graduation standard and giving out Local diplomas. Those could be given to anyone who got 55 score . Thus, in a yes-no test the student needed to know only 5% of the answers as the other 50% could come from random guessing. The shocking statistic here is that 73 students of 338 or 22% failed the state minimum over many years. Bailey did not divulge if anyone scored under 55, so the failing rate could be much higher.